HAS ARRIVED TO THE TORONTO ZOO! Left to Right: Jennifer Tracey, Senior Director of Marketing Communications & Partnerships, Toronto Zoo, The Honourable Nathalie Des Rosiers, Ontario Minister of Natural Resources and Forestry, Tracey Cooke, Executive Director, The Invasive Species Centre and Becky Cudmore, Regional Manager, Aquatic Invasive Species Program, Fisheries and Oceans Canada. Photo Credit: Toronto Zoo. TORONTO, ON, Thursday, February 15, 2018: The Invasive Species Centre along with the Toronto Zoo, Fisheries and Oceans Canada and the Ontario Ministry of Natural Resources and Forestry are proud to announce an amazing opportunity for youth and adults alike at the Toronto Zoo. The Big, Bad, and Ugly Asian Carp exhibitis now open for guests of the Toronto Zoo to see and experience for the first time in Canadian history! Asian carps consist of four species of fishes within the carp family; Bighead, Black, Grass, and Silver. These species are native to China and southern Russia but brought to the U.S. for a variety of purposes where they were purposefully and accidentally introduced into natural waterways. In many areas, these species have established self-sustaining populations, particularly in the Mississippi waterway system. After significant input and approvals from provincial and federal agencies, two species of Asian carps (Bighead and Grass) were brought to Toronto for public viewing at the Toronto Zoo, to help raise awareness of Asian carps and to highlight the risk of destruction that they pose to ecosystems, native fish species, and the Canadian economy and society. The live fishes will also allow visitors to see these species first hand and provide better insight into how to identify them; thereby increasing the vigilance of early detection with more eyes out on the water. Housed in a specially designed aquarium equipped with significant containment for the live fishes as well as DNA filtration systems, these fishes have been ensured by containment professionals with the Zoo and with officials from federal and provincial agencies that they will not pose any risk to Toronto’s waterways. 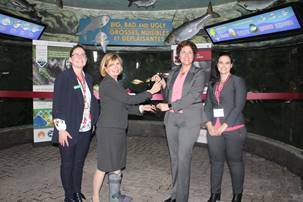 All partners involved with this project are proud to demonstrate their commitment to invasive species awareness education and inspiring life-long learning through their respective participation in this exhibit to be housed at the Toronto Zoo. 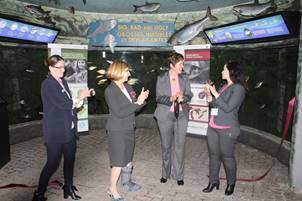 “I wish to congratulate the Invasive Species Centre and the Toronto Zoo on the opening of the new Asian Carp exhibit. We have seen the harm these destructive invasive species have caused in the U.S., and we know how vitally important it is to keep them out of Canadian waters. Together, through increased awareness and education, all Canadians can play a role in protecting our environment. This one of a kind exhibit will be an important tool to assist us in our efforts to prevent the establishment of Asian Carp in Canada.” - The Honourable Dominic LeBlanc, Minister of Fisheries, Oceans and the Canadian Coast Guard. “Invasive species, like Asian carps, can cause significant damage to our ecosystems and native wildlife. Through our partnerships with organizations like the Toronto Zoo, the Ontario Federation of Anglers and Hunters, the Invasive Species Centre and the federal government, the government of Ontario will continue to fight against the spread of invasive species and raise awareness about the environmental and economic risks they pose.” – The Honourable Nathalie Des Rosiers, Minister of Natural Resources and Forestry. For more information about The Big, Bad & Ugly Asian Carp exhibit at the Toronto Zoo, please visit www.asiancarp.ca. The Invasive Species Centre is a non-profit organization that connects stakeholders, knowledge and technology to prevent and reduce the spread of invasive species that harm Canada’s environment, economy and society. The Invasive Species Centre works with a broad range of stakeholders to help: identify needs for knowledge, tools, and resources; coordinate and support projects and build competencies to contribute to invasive species management; and to share knowledge and technology to raise awareness and empower citizens to take action in their communities. Visit the ISC family of websites at www.invasivespeciescentre and check out our Facebook, Twitter, and LinkedIn. Fisheries and Oceans Canada (DFO) has the lead federal role in managing Canada’s fisheries and safeguarding its waters. The Canadian Coast Guard (CCG), a Special Operating Agency within DFO, is responsible for services and programs that contribute to the safety, security, and accessibility of Canada’s waterways. The Department supports strong economic growth in our marine and fisheries sectors by supporting exports and advancing safe maritime trade; supports innovation through research in expanding sectors such as aquaculture and biotechnology; and contributes to a clean and healthy environment and sustainable aquatic ecosystems through habitat protection, oceans management, and ecosystems research. The Ministry protects Ontario’s biodiversity while promoting economic opportunities in the resource sector and supporting outdoor recreation opportunities. We sustainably manage Ontario’s fish and wildlife resources, lead the managements of Ontario’s Crown lands, water, oil, gas, salt and aggregates resources, including making Crown land available for renewable energy products, ensure the sustainable management of Ontario’s Crown forests, guide the management of Ontario’s parks and protected areas, protect the people property and communities from forest fires, floods and droughts, develop and apply geographic information to help manage the province’s natural resources. For more information about the Ontario Ministry of Natural Resources and Forestry visit www.ontario.ca/page/ministry-natural-resources-and-forestry. The Toronto Zoo is Canada’s premier zoo and a national leader in saving wildlife to ensure the rich diversity of nature for future generations. More than a tourist attraction, the Toronto Zoo boasts a number of leading programs for helping wildlife and their natural habitats – from species reintroduction to reproductive research. A world-class educational centre for people of all ages, the Toronto Zoo is open every day except December 25 and attracts approximately 1.3 million visitors each year. Toronto Zoo is accredited by CAZA (Canada's Accredited Zoos and Aquariums) and AZA (Association of Zoos and Aquariums). Look for these logos whenever you visit a Canadian zoo as your assurance that you are supporting a facility dedicated to providing excellent care for animals, a great experience for you, and a better future for all living things. For more information, visit caza.ca and aza.org.